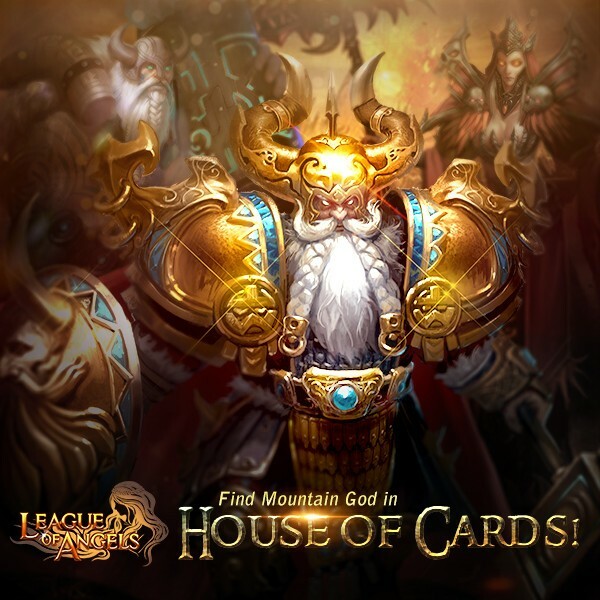 LoA_Win Mountain God in House of Cards! - You can swap the required cards for: Mountain God, Blazing Hecate, Hercules, Hecate, Earthshaker, Light Envoy, Dark Valkyrie, Devine Hunter, Arcane Spirit, Lvl.8 MATK+DODGE Gem, Lvl.8 Dodge+Block Gem, Lvl.8 PATK+HP Gem, Lvl.8 Crit+Hit Gem and many more! 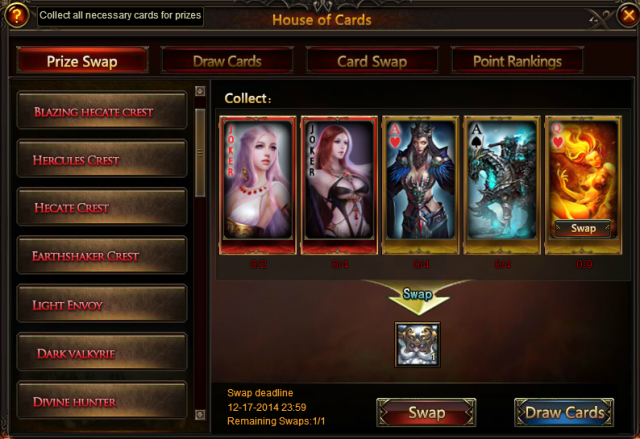 Card Lotto Voucher x50, Quiz Voucher x60, Seraph's Stone x500, Runestone x5000, Dragon Tamer Card(50) x5. Description: Play House of Cards every day to win Card Point to gain extra Card Point, Joker, Jake of Spades, Queen of Spades, King of Spades and Ace of Spades. Description: Release dragons to win Angel Tears, Gold and Card Lotto Voucher! Description: Consume certain diamonds will get extra rewards including Quize Voucher, Eternal Spire Challenge Card, Card Lotto Voucher and many other items. More exciting events are coming up through Dec. 12 to Dec. 15, check them out in the in-game How Events menu now!